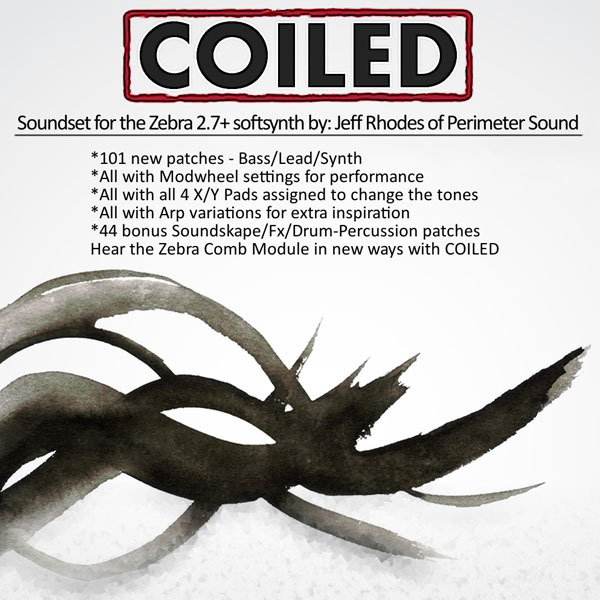 COILED is a sound set for the U-he Zebra 2.7+ softsynth vsti. Featuring - 101 new presets each with an Arp variation. 17 Soundskapes, 17 Fx, and 10 Drum/Percussive patches are also included in the set as a bonus. The focus of this set is on the amazing Comb Module of Zebra, with a variety of plucks, bows, and purely synthetique creations - you are bound to discover new moods and be taken in different creative directions. From Steampunk to Cinematic, and from Industrial to Dance-able, this collection has a little bit of something for everyone. New sounds that you haven't already used to death, and with X/Y and Modwheel controls to keep them changing and staying fresh for a long time. Check out the great demos by Nick Moritz and Ed Ten Eyck to get an idea of how the patches sound in action, then grab the freebee try-before-you-buy set to use some in your own studio. Note : Some of the percussion heard in the demos is from the SoundSpice loop sample collection 'Clanks Vol 1'.